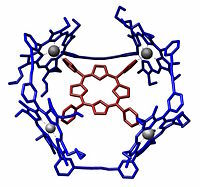 An example of a supramolecular assembly in a crystal structure. It was reported by Jean-Marie Lehn and coworkers in Angew. Chem., Int. Ed. Engl. 1996, 35:1838-1840. Supramolecular chemistry refers to an area of chemistry that specializes in the study of noncovalent interactions within and between molecules. Traditionally, chemists have focused on studying how atoms and ions are held together by covalent bonds and ionic bonds, and how these bonds are formed and broken during chemical reactions. By contrast, researchers in supramolecular chemistry examine the weaker and reversible noncovalent interactions, such as hydrogen bonding, metal coordination, hydrophobic forces, van der Waals forces, pi-pi interactions, and electrostatic effects. Supramolecular complex of a chlorine ion in cucurbituril and cucurbituril. It was reported by Day and coworkers in Angew. Chem. Int. Ed. 2002, 275-277. 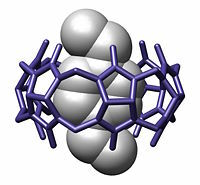 An example of a mechanically-interlocked molecular architecture in this case a rotaxane. It was reported by Stoddart and coworkers in Eur. J. Org. Chem 1998, 2565-2571. An example of a host-guest chemistry reported by Sanders and coworkers in Angew. Chem., Int. Ed. Engl. 1995, 34:1096-1099.
host-guest complex with a p-xylylenediammonium bound within a cucurbituril. It was reported by Freeman in Acta. Crystallogr. B 1984, 382-387. 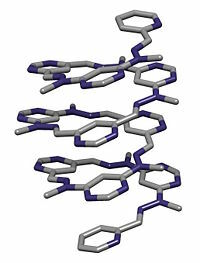 Intramolecular self-assembly of a foldamer. It was reported by Lehn and coworkers in Helv. Chim. Acta. 2003, 86:1598-1624. Important areas that have been addressed by supramolecular chemistry include molecular self-assembly, molecular folding, molecular recognition, host-guest chemistry, mechanically-interlocked molecular architectures, and dynamic covalent chemistry. Supramolecular chemistry has proved useful for the development of new materials, pharmaceuticals, drug delivery systems, high-tech sensors, and contrast agents for CAT scans. It is also useful for the design of catalysts, solid-state reactions, and treatments of radioactive wastes. In addition, the study of noncovalent interactions is crucial to understanding many biological forms and processes, including cell structure and vision. The desire to study biological systems often provides the motivation behind supramolecular chemical research. The existence of intermolecular forces was first postulated by Johannes Diderik van der Waals in 1873. However, supramolecular chemistry has its philosophical roots in the work of Nobel laureate Hermann Emil Fischer. In 1890, Fischer suggested that interactions between an enzyme and its substrate take the form of a "lock and key," a concept that has since been valuable in explaining molecular recognition and host-guest chemistry. In the early twentieth century, noncovalent bonds were understood in gradually increasing detail, with the hydrogen bond being described by Latimer and Rodebush in 1920. The use of these principles helped develop an understanding of the structures of various biological macromolecules and processes. For instance, the important breakthrough that allowed elucidation of the double-helical structure of DNA occurred after it was realized that DNA consists of two separate strands of nucleotides connected through hydrogen bonds. The use of noncovalent bonds is essential to replication because they allow the strands to be separated and used as templates for new double-stranded DNA. Concomitantly, chemists began to recognize and study synthetic structures such as micelles and microemulsions, which involve noncovalent interactions. Eventually, chemists took these concepts and applied them to synthetic systems. The breakthrough came in the 1960s, with the synthesis of crown ethers by Charles J. Pedersen. Following this work, other researchers—including Donald J. Cram, Jean-Marie Lehn, and Fritz Vogtle—became active in synthesizing shape- and ion-selective receptors. Throughout the 1980s, research in the area proceeded at a rapid pace, with the emergence of concepts such as mechanically interlocked molecular architectures. The 1987 Nobel Prize for Chemistry was awarded to Donald J. Cram, Jean-Marie Lehn, and Charles J. Pedersen, in recognition of their work in the area of supramolecular chemistry. The development of selective "host-guest" complexes in particular, in which a host molecule recognizes and selectively binds to a certain guest, was cited as an important contribution. In the 1990s, supramolecular chemistry became even more sophisticated, with researchers such as James Fraser Stoddart developing molecular machinery and highly complex self-assembled structures, and Itamar Willner developing sensors and methods of electronic and biological interfacing. During this period, electrochemical and photochemical motifs became integrated into supramolecular systems to increase functionality. In addition, research was initiated in the areas of synthetic self-replicating systems and molecular information processing devices. The emerging science of nanotechnology also had a strong influence on the subject, with building blocks such as fullerenes, nanoparticles, and dendrimers becoming involved in synthetic systems. However, low temperatures can also be problematic to supramolecular processes. Supramolecular chemistry can require molecules to distort into thermodynamically disfavored conformations (for example, during the "slipping" synthesis of rotaxanes), and may include some covalent chemistry that goes along with the supramolecular. In addition, the dynamic nature of supramolecular chemistry is utilized in many systems (for example, molecular mechanics), and cooling the system would slow these processes. Thus, thermodynamics is an important tool to design, control, and study supramolecular chemistry. Perhaps the most striking example is that of warm-blooded biological systems, which cease to operate entirely outside a very narrow temperature range. Molecular self-assembly refers to either (a) the folding of individual molecules (such as polypeptides) or (b) the formation of structures involving two or more molecules, through noncovalent interactions. The process may therefore be classified as either intramolecular or intermolecular, respectively. The molecules are said to "self assemble" because the structures are formed based on the inherent properties of the molecules involved, without management from an external source (other than the provision of a suitable environment). Molecular self-assembly allows for the construction of large structures such as micelles, membranes, vesicles, and liquid crystals. It is important for crystal engineering. Molecular recognition refers to the specific binding of a "guest" molecule to a complementary "host" molecule, to form what is called a "host-guest complex." Often, assignment of the terms "host" and "guest" to the molecular species is arbitrary. The molecules are able to identify each other through noncovalent interactions. Key applications of this field include the construction of molecular sensors and catalysis. Molecular recognition and self-assembly may be used with reactive species in order to pre-organize a system for a chemical reaction (to form one or more covalent bonds). It may be considered a special case of supramolecular catalysis. Noncovalent bonds between the reactants and a "template" hold the reactive sites of the reactants close together, facilitating the desired chemistry. This technique is particularly useful for situations where the desired reaction conformation is thermodynamically or kinetically unlikely, such as in the preparation of large macrocycles. This pre-organization also serves purposes such as minimizing side reactions, lowering the activation energy of the reaction, and producing desired stereochemistry. After the reaction has taken place, the template may remain in place, be forcibly removed, or may be "automatically" decomplexed on account of the different recognition properties of the reaction product. The template may be as simple as a single metal ion or may be extremely complex. In a mechanically-interlocked molecular architecture, two or more molecules are linked to each other as a consequence of their topology. The molecular species may exhibit some noncovalent interactions, but they are not attached to each other by covalent bonds. Supramolecular chemistry, and template-directed synthesis in particular, is key to the efficient synthesis of these compounds. Examples of mechanically-interlocked molecular architectures include catenanes, rotaxanes, molecular knots, and molecular Borromean rings. In dynamic covalent chemistry, covalent bonds are broken and formed in reversible reactions under thermodynamic control. Although covalent bonds are key to the process, the system is directed by noncovalent forces to form the lowest energy structures. Many synthetic supramolecular systems are designed to copy functions of biological systems. These biomimetic architectures can be used to learn about both the biological model and the synthetic implementation. Examples include photoelectrochemical systems, catalytic systems, protein design, and self-replication. Molecular imprinting describes a process by which a host is constructed from small molecules using a suitable molecular species as a template. After construction, the template is removed, leaving only the host. The template for host construction may be subtly different from the guest that the finished host bind. In its simplest form, imprinting utilizes only steric interactions, but more complex systems also incorporate hydrogen bonding and other interactions to improve binding strength and specificity. Molecular machines are molecules or molecular assemblies that can perform functions such as linear or rotational movement, switching, and entrapment. These devices exist at the boundary between supramolecular chemistry and nanotechnology, and prototypes have been demonstrated using supramolecular concepts. 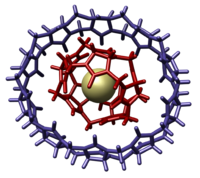 Supramolecular systems are rarely designed from first principles. Rather, chemists have a range of well-studied structural and functional building blocks that they can use to build up larger functional architectures. Many of these building blocks exist as whole families of similar units, from which the analog with the exact desired properties can be chosen. The complexation of bipyridines or tripyridines with ruthenium, silver, or other metal ions is of great utility in the construction of complex architectures of many individual molecules. The complexation of porphyrins or phthalocyanines around metal ions gives access to catalytic, photochemical, and electrochemical properties as well as complexation. These units are often found in nature. Cyclodextrins, calixarenes, cucurbiturils and crown ethers are readily synthesized in large quantities, and they are therefore convenient for use in supramolecular systems. More complex cyclophanes, and cryptands can be synthesized to provide additional tailored recognition properties. Many supramolecular systems require their component molecules to have suitable spacing and conformations relative to each other. Construction of these systems requires structural units that can be readily employed. Commonly used spacers and connecting groups include polyether chains, biphenyls, triphenyls, and simple alkyl chains. The chemistry for creating and connecting these units is well understood. Porphyrins and phthalocyanines have highly tunable photochemical and electrochemical activity, as well as the potential for forming complexes. Photochromic and photoisomerizable groups have the ability to change their shapes and properties (including binding properties) upon exposure to light. Tetrathiafulvalene (TTF) and quinones have more than one stable oxidation state, and therefore can be switched with redox chemistry or electrochemistry. Other units—such as benzidine derivatives, viologen groups, and fullerenes—have also been utilized in supramolecular electrochemical devices. DNA has been used as both a structural and functional unit in synthetic supramolecular systems. Supramolecular chemistry, and molecular self-assembly processes in particular, have been applied for the development of new materials. Large structures can be readily accessed using bottom-up synthesis, as they are composed of small molecules requiring fewer steps to synthesize. Most of the bottom-up approaches in nanotechnology are based on supramolecular chemistry. A major application of supramolecular chemistry is the design and study of catalysts and catalysis. Noncovalent interactions are extremely important in catalysis, binding reactants into conformations suitable for reaction and lowering the transition state energy of reaction. Template-directed synthesis is a special case of supramolecular catalysis. Encapsulation systems such as micelles and dendrimers are also used in catalysis to create microenvironments suitable for reactions (or reaction steps) that may not be possible otherwise. Supramolecular chemistry is useful for the development of new pharmaceutical therapies, as it provides an understanding of the interactions at drug binding sites. The area of drug delivery has also made critical advances as a result of supramolecular chemistry providing encapsulation and targeted-release mechanisms. In addition, supramolecular systems have been designed to disrupt protein-protein interactions that play important roles in cellular functions. 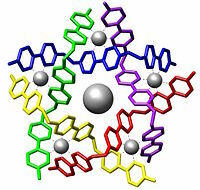 Supramolecular chemistry has been used to demonstrate computation functions on a molecular scale. In many cases, photonic or chemical signals have been used in these components, but electrical interfacing of these units has also been shown by supramolecular signal transduction devices. Data storage has been accomplished by the use of molecular switches with photochromic and photoisomerizable units, by electrochromic and redox-switchable units, and by molecular motion. Synthetic molecular logic gates have been demonstrated on a conceptual level. Full-scale computations have been achieved by semi-synthetic DNA computers. Research in supramolecular chemistry has allowed for the development of reactions that proceed in the solid state, directed by noncovalent bonding. Such processes are highly desirable because they reduce the need for solvents during the production of chemicals. In this manner, these approaches are part of what is called green chemistry. Supramolecular chemistry is often pursued to develop functions that cannot be performed by single molecules. These functions include magnetic properties, light responsiveness, self-healing polymers, and molecular sensors. Supramolecular research has been applied to develop high-tech sensors, processes to treat radioactive waste, and contrast agents for CAT scans. ↑ J.M. Lehn, "Supramolecular chemistry," Science 260(5115), 1993: 1762-3. ↑ Gennady V. Oshovsky, David N. Reinhoudt, Willem Verboom, "Supramolecular Chemistry in Water," Angewandte Chemie International Edition 46(14)2007: 2366-2393. ↑ Harold M. Schmeck, Jr., Chemistry and Physics Nobels Hail Discoveries on Life and Superconductors; Three Share Prize for Synthesis of Vital Enzymes. Retrieved December 2, 2007. This page was last modified on 14 October 2016, at 19:13.